I try to keep this blog to mostly crochet (or crochet adjacent) projects, but sometimes I can't help myself, I have to post non-crochet stuff because it's just too awesome. I've spent the last week fully immersed in recycling creativity, and while I love the projects that I came up with, there are a ton of projects that other people have made that are so awesome they needed to be shared. There's been such a cool vibe around here this week, I knew you guys would be into it! I loved these recycled cereal box projects over at One Good Thing by Jillee. I especially loved the pencil box project, since I think it would just make the coolest hook case. I want to make a bunch of them!!! 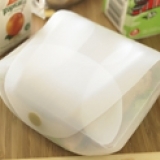 This reusable lunch container is made out of a gallon milk jug! How rad is that?! I am so completely in love with this project! You can check it out over at Spoonful. One last thing: There is a fine line between recycling to make the planet a better place, and recycling out of a massive crushing guilt that you're killing the planet because your drink straw doesn't decompose. You know I love you, and you know I love our world, but I have a dining room filled with literal garbage right now that I was using as art supplies. I can't live like that on a normal, every day basis. I'm going to have to put most of it in our recycle bin, and I'm also going to have to be okay that some of it is going to go into the trash can. I know that I've dramatically cut down my plastics consumption lately, because I'm now aware of all of the packaging that products/food/daily-life comes in. I am making different (better, informed) choices for myself and our planet, and I'm not going to let myself become overwhelmed by guilt fear anger shame anything that I've done/not done in the past that I can't un-do/do now. It's such a slippery slope, this eco-thinking, because it's not just you. Or me. It's manufacturers who should know better (I'm looking at you, Kraft Foods, purveyor of Capri Sun pouches). It's convenient meals, and convenient bags to carry the meals home in. It's plastic wrapping on paper towels. It's restaurants that serve meals in styrofoam. It's not any one person's fault. We all work hard. Very, very hard. The convenience of being able to pop a plastic tray into the microwave and have dinner in 4 minutes is sometimes the difference between me and insanity. There is a high cost of cooking every meal from scratch, and that cost is time, and sometimes that price is too high. We have to cut ourselves some slack, and allow ourselves to be flawed, imperfect, and still consider ourselves a good person. Some of you may want to argue with me about this, and that's okay, I'd love to throw this up for discussion. This week has been eye-opening for me, and I'm excited and thrilled to discover new ways that I can use things that I already have, but I'm not going to have a melt down if my sister surprises me with an ice-blended chai tea in a plastic to-go cup. I'll enjoy the surprise, and recycle what I can. Because I'm flawed, imperfect, and I'm a good person. I know, I didn't either! Oh and PSST totally wanted to do the January button exchange with you, but we are moving soon, so my mind has been scattered all over to try to create a graphic! Actually I will pop over and see if Blogger will let me add yours anyway without a fight - I wiggle between computer literacy/functionality WIN and OMG THIS IS TOO DIFFICULT in an astonishingly short amount of time! Haven't played with the layout adding stuff in a looong time. Hope to be back saying HEY LOOK SUCCESS! Wow, that was easy, come see! Hi Kristi! OMG I love your little cupcakes! They are so cute! And I've got to say that my button looks great on your site! Make sure you let me know when you make one for yourself! And thanks for the kind words about recycling. You know, that K-cups thing surprises me!! Aren't we supposed to be having this "awareness" (big companies included!!!) that would move us to proceed in a more responsible way?? We live in a rural area and I was pleasantly surprised recently when the County announced that they would be providing recycling containers for paper. Yeah, I said paper!! They are a bit slow; but I've seen our household garbage decrease by one-half, if you can believe it, ever since we started separating the paper. I guess we all just have to do the best we can. But that K-cups thing is bothersome!! It was bothersome to me, too! That's why I had to search for a solution. 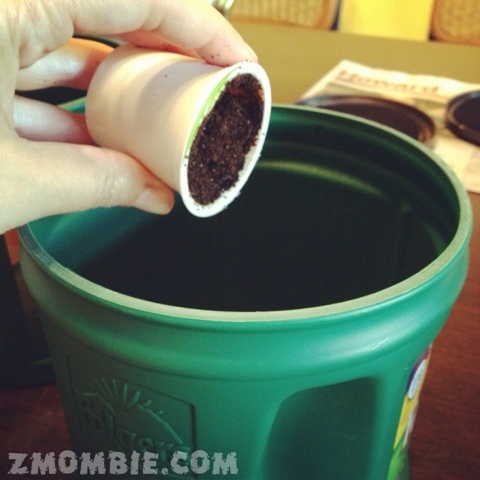 I love the idea of turning the K-cups into garden starters for seedlings. Better than just throwing them away, right? I like the pencil idea...I went to the blog to look at it, then I saw that it was in Spanish. I'm learning Spanish, so I read and understood most of it, and the pictures helped. Psh, I don't need Google's translate thing! ;) Just thought I'd add that. The K-Cup thing is interesting, too. We go through at least four or five everyday...maybe I could start doing stuff like that. First off, I would NEVER go all hater on you! You absolutely get a pass -- go with what your parents say. (Obviously they're doing something right, I can't read Spanish! ;D ) If this makes you more aware of green options, and it helps you take a step in that direction, then I feel like I've done my job. Awareness is the first step. Amen, sister. You gotta do what you can, but sometimes you just can't, and that's ok.
Yay! So awesome you found a link where someone came up with a use for those K-cups! Woot! I hope I can come up with some more in the future too! Someday I will have a Keurig machine but I'm looking into those reusable cups you can fill yourself. That milk jug lunch container is really wonderful too! I'm thinking Thanksgiving and sending people home with leftovers - no worries about getting your container back cuz you can always make more! LOL. Awesome, awesome post! Oh, also thank you for agreeing with me that more of the onus of recycling needs to go with the manufacturers to find better packaging methods. We have no control over that and can't do a thing about it but try and force them to do better. And yes, in a perfect world, cooking from scratch would be better for everyone and leave less to recycle, but you're right, we are not in a perfect world and time is a thing some people don't have enough of. I'm just hoping people will realize that some things from scratch really don't take much longer than packaged and the benefits are so worth it. But if each person does make an effort, we'll be making a difference. You are as wise as you are funny! I'm bad about hanging onto things that "might come in handy someday" or which I think I can create something out of; if 1 empty Benefiber container makes a great yarn holder, 20 would be even better! Also have had to beat down the guilt thing, but I think I'm finally ok there. I do so wish companies would stop wasting packaging; even if the material isn't recyclable it could be smaller - seems like any packaged food has at least 30% more packaging than is needed to hold the food. Or small items that are easily shoplifted have 200% more packaging in the form of empty heat-sealed plastic surrounding the item which is not just unnecessary but is likely to cause you to slice your wrist open trying to pry out the item you bought. Or the micro sd card I just ordered online comes in a box big enough for a pair of shoes, nestled in 18 of those poofy air pack thingies. I think your plan is balanced and nifty. Hi Karen!!! Oh my goodness, me too! I try not to be a craft supply hoarder, but I'm terrible, especially about plastic containers that I might someday find the perfect use for! LOL!!! I miss you!! I think of you and your family often, and wish you all the happiness you deserve!!! Hello, Dianne! Take a look at these swatches!